sparkling wine (GB) Your browser does not support any audio element. spumante (I) Your browser does not support any audio element. 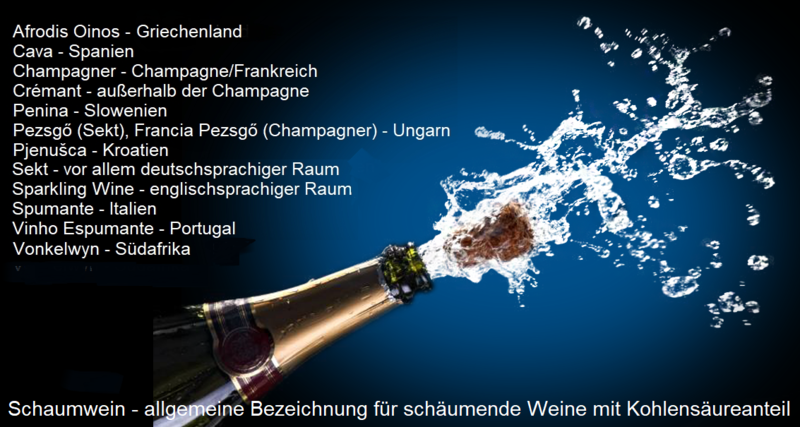 Especially in German-speaking countries common name for a produced according to certain quality criteria sparkling wine (Quality sparkling wine). Except for Champagne produced sparkling wines, even if they were produced according to champagne rules, must not call Champagne. This is not a question of quality, but the question of quality ancestry, The names in other countries include Afrodis Oinos (Greece), Cava (Spain), Crémant (outside Champagne in France, but also other countries), Pezsgő (Hungary), Sparkling Wine (Overseas) and Spumante (Italy). The steps are very similar and under champagne described. In contrast to champagne is the second fermentation when sparkling wine often in steel tanks in the pressure tank process, which named after the inventor Méthode charmat, The wine is in a pressure tank after addition of sugar and yeast fermented and also left a certain time on the yeast. From there is also under pressure the finished sparkling wine filtered and then on bottles filled. This procedure saves the time-consuming work steps remuage (Shaking) and dégorgement (Remove yeast pack). The second difference to champagne is the blending method, A classic champagne is often (but not exclusively) one Cuvée from different documents. vintages and mostly Pinot Noir and Chardonnay, A champagne, however, is mostly unmixed made from grapes of the same situation and vintage. In Germany it becomes predominantly Riesling and in Austria the varieties Riesling. Green Valtellina and Chardonnay but also used others. But there are also many brands of sparkling wine, although after the classical method, so with bottle fermentation getting produced. In this case is on the label depending on the country of manufacture, the term "Méthode traditional" or "Méthode classique" commonly used in France, Germany and Austria and "Metodo tradizionale" or "Metodo classico" in Italy. The term "sparkling wine" is not origin moderately Although Germany tried for decades to allow the name only in countries with German state language. After lengthy litigation, an EU decision finally confirmed in 1975 that this linguistic restriction was discriminatory. Quality sparkling wine may thus be produced worldwide under the name of sparkling wine. By the middle of the 19th century, any sparkling wine in many countries was considered irrespective of its actual origin champagne designated. The origin of the name sparkling wine lies in the Latin word "siccus", which means dry. The preferred wine in the Middle Ages in the southern climes was a sweet, heavy dessert wine. As a name for harsh wine finally sat down "secco" (Spanish "seco"). Later it was called any South wine (especially the Spanish), whether sweet or harsh, as "Vino seco", in France he was called simply "le sec". England moved from Spain to the sherry and called him "Wyne seck", of which bag Remained and synonymous with fortified Spanish wine. This is still reminiscent of the sherry brand "Dry Sack" Williams & Humbert. In the Thirty Years' War (1618-1648) the name "Seck" appeared and mutated to "Seckt", then to "Sect" and finally to "Sekt". But still, it was not a sparkling wine, but simply Spanish wine in general. In technical literature, the term was not used for a long time and it was not included in the famous German dictionary of the Brothers Grimm. As a general term for sparkling wine, sparkling wine then slowly became established until the end of the 19th century and was officially recognized in 1894 by the founding of the "Verband deutscher Sektkellereien". In Meyers Konversations-Lexikon, however, sparkling wine is briefly mentioned only in 1902 in a subordinate clause. The name Champagne was not allowed to be used after the First World War, which was even included in the 1919 Treaty of Versailles. After the German wine law from the year 1971, only those sparkling wines may be called sparkling wines, which in the sensory At least 12 out of 20 points, at least 3.5 bar Carbon dioxide pressure have at least 10% vol alcohol content and have a maximum content of 200 mg / l of total sulfur. There are different names. In champagne without additional name may base wines from different countries (including wines outside Germany). As German sparkling wine only products may be called, which were produced from German base wines; that may well be blends of wines from different growing areas. A sparkling b. A. may only be made from wines originating from the region indicated on the label. 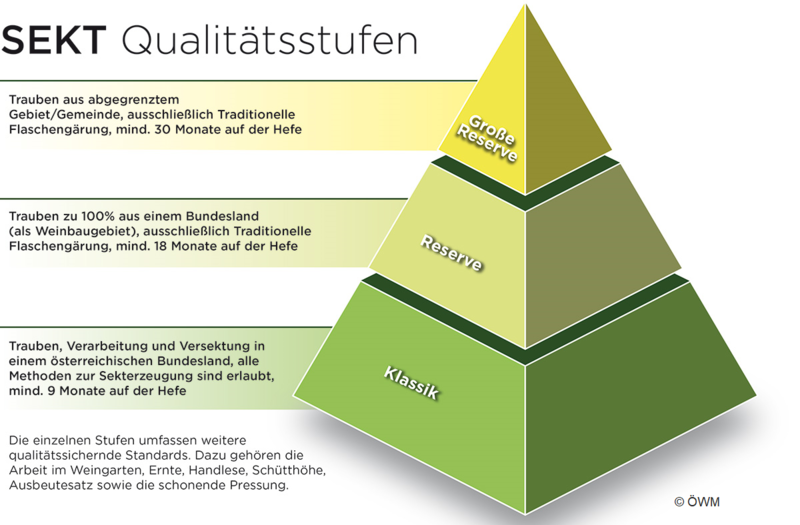 From the year 2015, a three-stage quality pyramid for Austrian sparkling wine was introduced. The designations are "classic" (in white, red and rosé, all champagne fermentation methods, all stylistics and dosages, 9 months lees, Max. Alcohol content 12.5% vol, vintage allowed, grapes from one federal state), "reserve" (in white and rosé, no blend of red and white basic wine for the Rose. yield 60% bottle fermentation, 18 months yeast, max. 12 g / l residual sugar = brut nature, extra brut or brut, vintage allowed, grapes from one federal state) and "large reserve" (in white and rosé, no blend of red and white base wine for the rosé, handpicking with max. dumping height 35 cm, yield 50%, bottle fermentation, 30 months yeast, max. 12 g / l residual sugar, grapes from a single wine-growing community, location designation allowed). An often asked question is whether sparkling wines such as champagne or champagne durable or suitable for long storage and as a high quality Still wine matures and evolves. As a rule, it has already reached its peak after marketing. Around the enjoyment of sparkling wine (champagne) has developed a diverse culture. See under Champagne cocktail. Champagne glass. Champagne bucket. Champagne pyramid. Champagne Pliers and sabrage (Champagne-heads). This page was last modified at 5 April 2019 at 17:42.